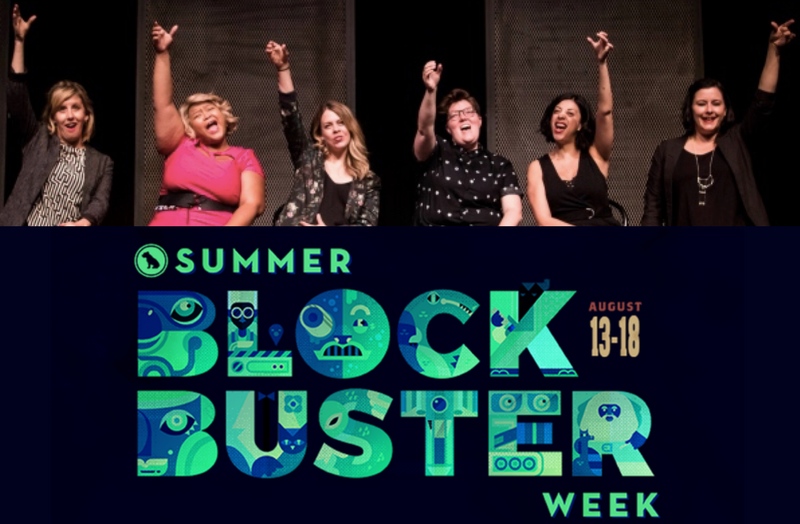 There’s some pretty stellar comedy to be found in Toronto this summer and it’d be a shame to let it go undiscussed in the craziness of festival season. So, while I hate to combine sketch & improv into one article (and be scolded for it by comedians- I Know They’re Very Different! ), here’s a roundup of what’s made me laugh this week. On Wednesday I stopped by one of my favourite venues in the city to take in two shows that are part of Bad Dog Theatre Company’s annual celebration of TV and Movies. Split into an 8pm and a 9:30 performance, the evening really consisted of six separate short shows programmed into groups of three that seemingly had very little to do with each other. The first block started with Sad Man Horsehead, a middling longform that tried to tap into the unique tragicomedy of Netflix masterpiece Bojack Horseman but missed the mark on capturing the show’s lynchpin honesty and balancing silliness. That was followed by Side Side Story, a good concept (what happens to the side characters in a West Side-esque plot?) with somewhat shaky execution working with tricky suggestions (fortune cookie writers vs. cosplayers) but a couple standout moments mostly courtesy of King Chiu as a romantic skeptic always wondering why no one asks about him and Ajahnis Charley as a really invested cosplayer dropping names I didn’t understand. Then came Haunted, a rock solid genre piece that was clean and clever with an excellent cast and strong structure that jumped off from parody but didn’t rely on it for every laugh. The second block was even more scattered in terms of the type of shows presented (if there was meant to be some sort of throughline in the programming, it was lost of me) but stronger on average. Florian François’ one-man Home Alone wasn’t my cup of tea but it was also only 6 minutes long so no harm no foul. Canadian Idol, hosted by an exuberant Tom Hearn as “poor man’s Carson Daly” Ben Mulroney, relied too heavily on celebrity judge impressions that were mostly bad or forgettable except for Chantey Marostica’s sublime Justin Bieber, but the improvised songs sung by the final four “contestants” were fantastic, highlighted by Carly Heffernan who was somehow both the wackiest and the most profound, and Selena Vyle who rocked a melancholy ballad about her dead mom in a baritenor so strong it broke the concept because no one that good was ever actually on Canadian Idol. But the show of the night was undoubtedly Coach Mom, a big-hearted goof fest based on a concept Alice Moran’s mom keeps pitching to her as a movie idea (“what if a mom calls into a radio show to critique the Buffalo Sabres and becomes their coach?!”). With Moran as the titular hero, a motley crew of hockey players discover their inner champions and bumble their way to victory by being polite, and also unleashing a werewolf onto the ice. Moran, Conor Bradbury, Filipe Dimas, Callum Wratten, Connor Low, and Scott Llyod make an excellent *ahem* team, not a weak link among them, and everyone seemed to be having too much fun to slip into the cynical “isn’t this concept just the stupidest? !” gags I was worried about. Coach Mom was just a crazy, earnest, happy good time soundtracked with songs from Mamma Mia! Here We Go Again (Seann Murray on point with the improvised lights & sound all night). It made my Mighty Ducks-loving heart so very very happy. Blockbuster Week ends on Saturday. Check out some shows if you can. Blockbuster Week Canadian Idol standout Carly Heffernan was also the director/head writer of this sketch revue playing late nights and weekend matinees until November. Draw whatever conclusions you want from this fact but this all female-written/directed/produced/styled/stage managed/designed/music directed/starring show is the sharpest, most consistent revue at The Second City in quite some time. Some sketches are better than others (and a few are repeats from recent mainstage productions) but there isn’t a dud in the whole performance. Each of the all-star cast members gets their standout moment (my favourites were an absurd T-Rex bit that lampoons sexist double standards, Kirsten Rasmussen turning into her mother, Tricia Black waking from a 10-year coma to discover all her heroes are sexual predators, and the Black/Ann Pornel/Ashley Comeau musical number “Rubenesque”) but it’s telling that the sketch that makes the biggest impact is a balanced ensemble piece featuring all six performers in concert. A gal pals brunch packed with obnoxious displays of contemporary behaviour and female friendship tropes at first reads like a fairly simple criticism of said behaviours and tropes, until the women start discussing the state of the world and reveal themselves to be smart and well-informed even as they’re parodies of their gender and generation. The point is an impactful and rarely-made one about condescending female stereotypes and the judgement we hurl at anyone who adheres to them. Steve Carell once said of Mindy Kaling “Mindy is exceptionally smart, but is not afraid to talk about nail polish. And yet, her love of nail polish does not take away from her smartness”. Listening to these gals at brunch swilling mimosas and ordering increasingly calorie-conscious cobb salads, our habit is to write them off- and, certainly, this complex and clever scene doesn’t let the women totally off the hook for their posturing or privilege- but it’s an important (and hilarious) reminder that people can be more than one thing and women so often are.